For a long time amateur singers of sea songs have had the magnificent repertoire of Anglo-American shanties as their sole reference. Today they are rediscovering the originality and the richness of French sea songs. From 1981 the publication 'Anthology of Sea Songs' by the magazine Chasse-Maree, the fruit of some 15 years of research into the sailors' oral heritage, has largely contributed to this new interest. This aspect of maritime culture has nevertheless still not received the recognition in France that it merits. We are far from the situation in the USA or in Britain, where ballads and shanties form a part of the atmosphere of all the festivals in honour of traditional sailing boats, and resound in all the pubs and bars along the coast! Nous gui n'en avions que trente de bons! To go and attack the English. The English struck their colours. We who had only thirty still working. A version totally unknown until this day! And a moment of true pleasure for Cabestan. This kind of exchange between singers and audience is just what the artisans of the present rebirth of interest in sea songs had been hoping for. To get to this point, a profound change of mentality was necessary: we are finally rediscovering the importance of the oral tradition. No, the song of the French sailors is not the short list of printed texts often of literary origin which has been circulating for half a century; it is the treasure which lies hidden in the memory of the people on the coasts of France. The thread had been broken. The relaunch of an effort to collect from old sailors has happily permitted a recovery of direct contact between those who know a song and those who wish to learn it. Progressively through meeting men of sail, a total culture is revealing itself: Jean-Francois de Nantes or Valpariso appear no longer as isolated songs, on the contrary, we see them as representative elements of a rich and varied repertoire. What makes the popular tradition valuable is the very fact that it has never been set down in writing. How many human relationships were necessary for one centuries-old song to come down to us by the sole vehicle of oral tradition? Songs dating back 300 years have thus been conserved, rejuvenated and refined by so many changes and human contact that they have become incomparable testimonies to the mentality of the sailors along our coast, and jewels of our cultural heritage. It was considered at this time that the whole traditional repertoire of sailors had been saved from obscurity by the work of Captain Armand Hayet, who in 1927 wrote a book on the Chansons de Bord. This well-written work presents, in the words of the author: '14 of the 18 true chansons de bords of the sailors'. Only 18 songs in the oral tradition! In the course of several centuries of navigation, French sailors must certainly have had little imagination, if one refers to the example of the English or Americans with several hundred shanties in their repertoire. These songs have been published in more than 30 collections of which the first, neverthless copious, goes back to 1887! And from 1945 the first high quality documentary records appeared, produced by the Library of Congress. To compensate for this apparent paucity (due, according to all the evidence, to the miserable research), certain interpreters delved into the American tradition; thus Hugues Auffrey adapted a shanty, Santy Anna and made a hit Santiano. Others like the 'Compagnons du large' reclalmed neopopular lyrics by Yann Nibor or Henry Jaques (Le Grand-mat veut de la route, inspired by the shanty Clear the track, let the bulgine run) or by Theodore Botrel ( La Corsairienne). During family dinners, evenings in cafes or in rare moments of relaxation on board, merchant sailors and fishermen of the '60s sang Parisian successes with a maritime theme (Je suis le Maitre a bord) or songs by Pierre MacOrlan (Fanny de Lannionn). The painstaking work of archive research, of bibliography work and, above all, of collecting from old sailors undertaken in the last 15 years has shown that, far from being imitations of English or American shanties, French sea songs have specific characterisics of great interest: songs for haling boats from the quay and for rowing, (unknown in England), a particular system of response in chorus, a repertoire of deck dances, and an original style of singing, very different from those used in the nearby rural areas. To research them, study them, and sing them today is a necessary and fruitful exercise. From the same period, in English-speaking countries, we have maritime novels of almost ethnographic precision, where allusion is made to shanties; 'Two Years Before the Mast' R W Dana, 1840 being the most famous of them. In his 'Picturesque Marine Dictionary' (1832), Jules Lecomte explains in detail the use of work songs on board ship. His precious account was, until the works of Armand Hayet, the only precise reference on this subject. 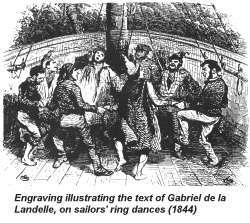 Augustin Jal in his 'Scenes de la Vie Marltime' (1832) precisely describes rondes du bord (ring dances) and the use of instruments, and cites 12 songs "With which the sailors amused themselves during leisure time on board, and which are quite out of place except between the bowsprit and the booms." Mostly very ribald songs, he quotes only two in their entirety: Le Navire Merveilleux (The Wonderful Ship) and Les Dix Navires Charges de Ble (The Ten Ships Loaded With Wheat). The rondes, the real rondes of the foredeck, those are the popular songs. They are not cooed in a husky voice, they are bellowed full-voiced, with all your lungs, they are repeated whilst dancing Breton style. If one funloving individual gets up and takes five or six companions with him, the song will start, and you will see the circle get bigger and sometimes a second circle will form around the first. On m'envoyait à l'herbe pour cueillir du cresson. La rivière est profonde, je suis tombée au fond. The river is deep and I fell to the bottom. Familiar traditional lyrics. The girl is saved by three sailors, and the song ends to the glory ... 'of all people of the sea who smell of tar'. In spite of all these promising texts, unfortunately no-one carried on the work, for reasons which are difficult to understand. It was not until l00 years later that a folklorist from the maritime world, Capt Hayet, was to describe the oral heritage of sailors. In the first half of the l9th century the Romantic movement incited writers such as Gerard de Nerval, George Sand to take an interest in peasant culture. and the first great collectors of popular song appeared in France around 1840. One man amongst them, E de Coussemacker, was to engage in exploring the coastal areas, coastal villages and the parts of towns in the ports of his area which sailors frequented. In 18S6 he published his 'Popular Songs of the Flemish in France'. Straight away we see that the harvest is abundant, and of exceptional quality: magnificent Icelandic fishermen's songs describing the cod fishing campaigns of Dunkirk in the 18th century, ballads about the corsairs and songs of dockers and fishwives and De Coussemacker, aware of the interest in this material, grouped them in a special chapter. This practice, alas, was not to be imitated in the other regions possessing a strong maritime tradition. Colled ar flod, named unan? A salc'haz en avel d'an Dorchen. Qui tint au vent de la Torche. Keeping to windward off La Torche. Did he hear it by chance on a walk around the port? In those days, hundreds of deepwater ships, coasters or whalers, were anchored at Paimboeuf. The place was propitious for international trade and this explains perhaps the origin of this song, which is a nicely gallacised version of the shanty Cheerily Men. Throughout the l9th century numerous dancing songs and ballads were nonetheless collected by chance in the regional surveys. Mostly songs with a maritime theme come from the coastal regions. The surveys by Noulle and Fleury in Normandy, by Sebillot, Orain and Cletiez in Brittany, Bujeaud in Poltou, Aunis and Saintonge made known, amongst others, several versions of the 31st of the Month of August, from 1845 for the words and 1865 for the tune. Naval Conscription, to which both seamen and rivermen were held, has nevertheless contributed to propagating the repertoire in vogue in La Royale (Navy) in the interior of the country. Around 1880, in the heart of Nivernais, A Millieu collected a beautiful ballad on a naval combat from the Seven Years' War, describing the 80-gun 'Foudroyant' being opposed by three English ships on the 25th of February 1758! Such a battle as ours. Otherwise, this ballad and others of the same type have been found in French Canada where the first collected items go back to 1860 with E Gagnon. From 1915 M. Barbeau was even to record singers on cylinders, safeguarding very ornamental singing styles which are totally original. The first sailors' work-songs were published at the beginning of the 20th century by E Herpin in Saint-Malo (Vielles Chansons de Saint-Malo, 1906) and J Richepin of Dieppe. These hauling songs have surprising lyrics and melodies which evoke the English shanties. Herpin specifies that the sailors' style of singing is so unusual as to defy description! Seventy years would have to pass before the importance of these songs would be recognised and their function better understood. In 1974, the Capt Jean Recher, evoking the arrival of the three-masted Newfoundlander in Fecamp, brings interesting detail to our attention: "We waited for the boats on the end of the jetty, they threw us a line, and all the people who were there pulled the ship, we called "haul on the rope". There were lots of people to pull: when we pulled, we had the rope on our shoulders, some behind, some in front, and we walked". Other Newfoundland fisherman said "we used to sing hauling songs whilst walking". Accorder (s') v.a. to act simultaneously, together; this expression is used to express the action of several men or several forces acting toward a common end, and to the same goal all concentrated on one single object. In a ship's boat it is necessary for the rower's to s'accorder, to transmit absolutely together the force that their oars transmit to the boat, to give it the impulse. As the oars must be turn in turn in the water and out of the water it is necessary to synchronise (accorder) the oars. When the sailors haul on a rope, in order for the force of these united actions to be the most complete, they s'accordent; it is by singing that they achieve this result. There are few people who, having been in a sea port, do not remember having heard along the quay sailors using songs full of harmony to help them in their work. And in these songs the agreement between the parts, the relation between the thirds, the tonics, the falsettos and the basses are admirably combined. The bold, rich motifs of some songs, full of harmony, furnish brilliant themes for an artist's imagination; the most astonishing thing in this aptitude most sailors have for singing with their strong, bitter, wild, and at the same time melancholy voices, is the ease with which they move from one musical mode to another. Thus, almost all songs to do with ropes have an initial motif in a major key, and a response in the minor; the verse is sung by the sailor who has the most resonant voice; this one, as they say, leads, (donne la voix - gives voice) ; the minor, which is almost always a sort of ritornello, is sung in chorus by the other sailors; it is then taken up again in the major. Not all have a good voice, but at least very few of them are incapable of joining in on the chorus, and none lack an ear. It is from the Americans that these sailors songs came, which belong to the poetry of the sea. This sometimes has a most gripping effect. I remember stormy nights when the sounds of the wind threw ominous menace into the air, or ironic whistles in the rigging. The waves rolled out grave melodies, the masts and the timbers shrieked and groaned under the efforts of the sails; sometimes one could hear above one's head sinister noises floating on the wind, without being able to link them to any idea, it sounded like the cries of shipwrecked sailors in distress. Sometimes these were poor birds wailing whilst skimming the tops of the waves; this great world of nature enveloped in a sombre mantle, sometimes penetrated by curious lightning flashes, the rigging changed its grave notes according to the vibrations of the wind passing through them, and to all the sailors added their songs. The wind carried them or mixed them with its high voices. The sailor pays no heed, he sings, because he has to s'accorder; the sail obeys to the transmission of force that is put into its the voice of the sailor dominates the lull; when he hears himself at the centre of the menacing atmosphere, he is happy. The words of the sailors' songs are not specially poetical. There are of course, in dock-work, at the unloading of cargo, some verses of which the sense simply has the purpose of encouraging work; the promise of taking it easy at the tavern are the refrains with these free verses, often improvised to an adopted tune. But most often the words are only monosyllables, of which the drawling consonants mingle with the notes of the song. Many words in the English maritime vocabulary are fashionable in sea songs. The word hourra, which is synonymous with courage, is often repeated. In the French colonies, negroes have a marvellous facility for improvising in order to s'accorder through this sort of song. The most trifling occurrence, the most fleeting impression will inspire a dozen verses, rhythmically poor and miserably rhymed undoubtedly, but marked with a certain causticity and a remarkably instinctive observation. On the other hand the melody is less rich, it turns only around thirds; but that gives it a bolder aspect, more warlike perhaps. Only in India are the songs of the black people richer in musical combination and present more motifs. On board state vessels sailors never sing, and it is to the sound of the bosun's whistle that they s'accordent. Get to it sailor! - To the windlass for the homeward trips. The salty pleasantries, joyous allusions fly back and forth, and then one of the men starts to sing the first words of a capstan shanty. The whole crew responds to this invitation, and it is a formidable choir that gaily punctuates the powerful march round the capstan. The falsetto voices of the novices mix with the rough tones of the sailors; the bosun, ceding to the magic of the vigorous song, takes his place at one of the bars and, for once ridding his hard face of the lines which are always there, joins in with the immodest refrain with his coarse voice made for reprimands and threats. Well before this date (1918), the text of the sea songs which make up this present collection had been definitively fixed by me. For a long time I had, indeed, had to tone down many of Jack Tar's expressions which were too rough to be printed. I had retreived, or restored as best I could, what could be considered the lesser of two evils, numerous verses lost for years, and had even completed certain songs which no longer had an ending, the last verses not having come through to us via the oral tradition, above all for the hoisting songs of which on modern sailing ships, no more than two or three verses were ever sung, this representing approximately the time necessary to finish hoisting and swing a topsail. If we owe an immense recognition to Captain Hayet for having saved an essential part of our maritime heritage, his work, such as he presents it, must however be approached in a critical way. It was certainly not as difficult as he asserts to collect songs from sailors in 1910, since almost 80 years later we are still collecting unpublished songs. In another artlcle (revue Musica No.17, 1955) Hayet published a capstan shanty, La Carméline which he had not integrated into his work "never having been able to come to an agreement with the singers on a definitive version which seemed just about authentic". Le barque n'est qu'un ponton! The ship was nothing but a hulk! * sapine: a makeshift coal barge drifted down the Loire to Nantes, then broken up and the wood sold. The notion of "a definitive and authentic version" is quite foreign to the folk tradition, and it is a pity that the author did not think of publishing all the versions! Et de l'acidulage pour vin blanc! And acid stuff for white wine! And even the famous hauling shanty Le Pont du Morlaix isn't always about Morlaix! But the sailors in the coasting track, sailors of the Royale, fishermen, not forgetting the ship's carpenters, the caulkers, the sailor's wives, the whole coastal population was singing sea songs marked by the professional stamp of the maritime world! 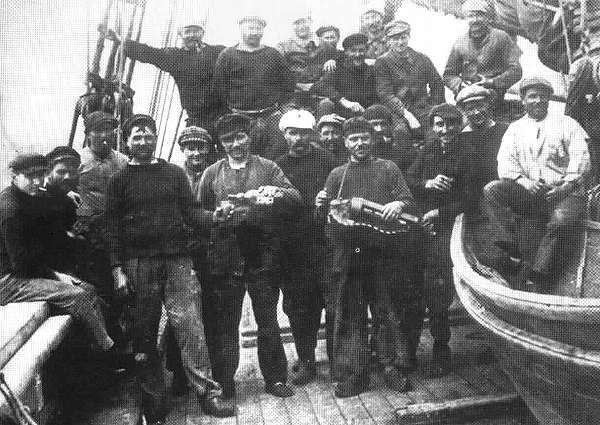 The first recordings of French sailors were made by the Museum of Arts and Popular Traditions in the '40s and '50s of the Newfoundland fishermen and Cape Horners in Saint Malo, but they mostly remained unpublished. In 1958 a record was made of the Congress of the Cape Horners in Saint Malo (Mouez-Breiz 39568). Amongst others, two good chantymen can be heard on this, commanding officers Gautier and Aubin leading Jean-Francois de Nantes and The Ten Breton Sailors. From 1970, the revival of field research led to the discovery of traditional singers with rich repertoires. But whilst excellent recordings of shanties were made in England from before 1960, in France only two records take note of the research done in the maritime world. Both of these are of Newfoundland fishermen. Pelle en bas tu n'auras pas. "When the boat was fishing on the banks of Newfoundland" explains Joe Klipfel of Saint Malo, "during the night sailors armed with wooden shovels dug a 'run', (that is to say, a trench) in the salt which was in the hold, so that they could lay in the first cod caught the next day." 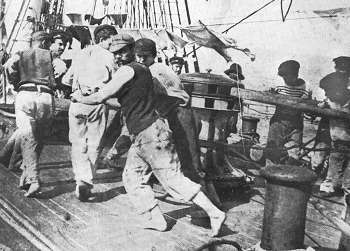 To keep their spirits up in this laborious work on board their ship, which when riding at anchor rolled from side to side, they had in the course of time made up inspiring songs. M. Herveic, of Cancale, notes that: "They were in groups of 12 to dig out the 'runs'. There was one who sang and the others answered in chorus. It was often the chief pelleta who led. When they had finished, they dropped their shovels and had a drink. They they started aft and worked forward"
"It was in winter when we danced circle dances", explains Delphin Lhomme, Newfoundlander from Fecamp. "When the sailors came back, we sang Newfoundland songs: "On the banks of Newfoundland My True Love Waits for Me" and so on! We all danced to the song, three steps to the left and three to the right. When somebody did not know it, we said "Il traille" (an obscure vernacular word meaning "to pull the wrong way in a dance, to get out of step, to do everything arse-up'ards)." In 1973, a group called Djiboudjep was founded in Lorient who, breaking with the affected style of choirs, very quickly achieved great success. 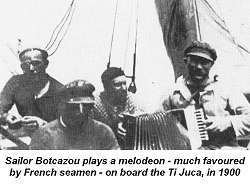 Apart from several airs collected by A Hayet, they sang a large number of adaptations - often far removed from the original - of shanties, also texts written by a young wholesale fishmerchant from Lorient, Michel Tonnerre, to melodies inspired by American folk songs. The group thus spread a new repertoire, and are very popular on the coast. But is it really necessary to look to Sailor Jack, the old enemy, for maritime inspiration Jean Matelot would not have had? Without denying the interest of all these adaptations, pastiches, or new works, it must be said that too often their composers did not have sufficient knowledge of the traditional context; the texts often sound literary, certain songs from the capital even sound like folk caricatures. Of course, all creation is positive, but it is regrettable that a lack of thoroughness in quoting sources has contributed to relegating the real sailors' songs to semi-obscurity. From left to right in the picture: Front - (with the cigarette) Daniel, Theophile Cocher de Ploubay, Alphonse Jean de Pleboulle (officer of the watch), Louis Besret called 'Papa Louis' of Plurien, the vielle player M Balan called 'Tambour' of Plurien, 'Le Portugais', Ange Jamet de Pleboule (officer of the watch), protector of the ship's boy, Jean Leray of Ploubalay, in the boat Eugene Balan of Plurien (brother of the Vielle player). Back - the two brothers Labbe: 'Le Gros' (fatty) and 'Le Petit' (titch) smoking a pipe, Francois Ploubalay a sailor from Plessy-Balisson, Jean Hayet de Saint-Michel-de Plelan, Joseph Rabardelle who crewed in the dory with Alphonse Jean. The vielle player who was nicknamed 'Tambour' was called Balan, and came from Plurien on the Cotes-du-Nord. He built his vielle himself, copying the type sold by the watchmaker Cloteaux of Lamballe between 1880 and 1914. This Lamballe model was made especially for the Bretons in the Pimpard workshops at Jenzat in Central France (note especially the depth of the body of the instrument). M. Balan only made one vielle; his brother, who was not a sailor, made thirteen, and sold theM. Eugene, Balan's brother (in the dory) is still alive and plays the vielle himself. The winds blow Nor West. From 1979, on the initiative of Bernard Cadoret and Michel Colleu, all the field research was gathered together and a new type of working group was formed, making possible the publication of records entirely renewing the maritime repertoire and its interpretation. The musicians who in 1981 recorded the first volume of the anthology of sea songs 'Chansons de Marins des Cotes de France' (SCM 001, 1981) came from greatly diiffering backgrounds, fishermen, journalist, ship's store manager, sailing school instructor, session musician and a luthier. There hasn't been the same situation for work songs, because no record exists of songs to manouvres on board the sailing ships, and the interpretations given today by elderly men have only an indicative value. Based on the accounts of sailors, it has however been possible to index all the types of work songs in use in France and to obtain a number of details on the way of singing theM. Contrary to what Captain Hayet said, who only mentioned hauling and capstan shanties, they sang in many other situations: at the capstan, but equally at the brake-windlass ,haling ships in port, unloading ships, at the pumps, salt-shovelling in Newfoundland, long-haul, hand over hand, stamp and go ... So we see that quite often specific songs were used. "To hoist the topgallants they sang to a rhythm which went with that work," explains Captain Vandesande, "a rhythm which was much quicker because a topgallant was hoisted with a stamp and go, but when they had to hoist a big sail, especially when the canvas was wet, well the lads had it harder, so the song was much slower." In the course of numerous meetings in preparation of the volumes of 'Anthologies des Chants de Mer', the singers and musicians sought hard to try and analyse the basic rhythms of the work songs. Listening to field-recordings was very valuable. Witness this moving evocation of working the brakewindlass by Captain Frelaux of Saint-Jacut. I worked at the windlass three times, in 1916, '17, and '18. In Newfoundland at that time they still did not have the donkey engine. You know we had a fine time, particularly when the weather was good. 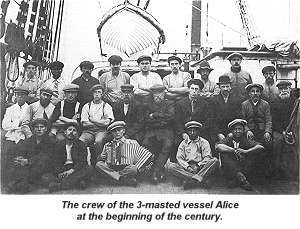 Everyone stopped their work, including the salter who came up from the hold, even if there was cod, including the captain, everybody was at the windlass. The novices stowed the chain. It was a pumping movement, at each stroke they hauled almost nothing: one pawl, then the bar knocked on the deck, the windlass went tac, tac, tac, it was the pawls dropping. When it was not too hard they sang, I remember. There was a man from around Dinan, I can still see him, who led, and the others answered. When there was a breeze, or even sometimes a storm and we had to bring in five or six links of chain, then they didn't sing any more, and everyone gave of his best to turn this chain and the anchor that was at the end. The knowledge acquired by John Wright from Stan Hugill, the comparison with specialists in manoevering great sailing ships, and listening attentively to the recordings of English and American shanties - several remarkable shantymen have been recorded since the '40s, like Richard Maitland - have enabled a reconstitution of the style with all the power and finesse which gives the worksongs their efficacity. It became very rapidly evident, however, that the most simple and the truest way of recovering the art of the work song ... was to do it in situ! In 1983 some musicians preparing the third volume of the Anthology and members of the association Treizour went out on a lovely sunny day - without a breath of wind - in the chaloupe (a Douarnenez sardine lugger) 'Telenn Mor'. They did not hoist the sails; they were there to pull on wood; and at each great karenn (oar) nine metres long, two oarsmen took their places. ... with no result - the rhythm did not seem to have any connection with the movement of the strokes. To the rhythm of the rowing song repeated in chorus, the rowers were able to keep in time and the lugger got up speed. Soon all were taken by the atmosphere, the movements became more efficient and the chaloupe began to cleave the water. One song followed another, The Bordeaux woman, My Father Sells Tobacco and above all The Three Sailors of Groix, which proved by far the best song for rowing in this type of Breton boat. What else would you expect? The return to Douarenez was an exceptional moment as much for the crew as for the bystanders at the end of the jetty who were to see passing a sardine boat returning at a lively speed, the whole crew singing with open throats, songs superbly adapted to the rhythm of rowing, and which resounded through the port. Even though nautical history, archaeology, and ethnology have enjoyed a veritable renaissance in our country in the last twelve years, the study of the oral culture of sailors, and notably of the songs, doesn't have the standing in France which it merits. Whether it is to do with the museums, the researchers, or even the public at large, our country stays distant from the great current interest in the subject which exists, in particular in the English-speaking countries: in the United States all the great museums have integrated shanties into their programme of studies and regular activities since 1970. ... to create an easygoing scholarly and musical forum for the easy exchange of songs, ideas and information among musicians, performers and the general public; and to present scholarship and the results of historical research about the songs, including oral history, field recordings, live performance, statistical and ethnological studies, historical and/or biographical studies. (Stuart M Franck, director of the Kendall Whaling Museum, and himself a musician). This regard for thoroughness does not exist at all in France, where sailors' songs are often still considered at best a pleasant pastime when they are not ignored altogether. Even the 'Belem', a prestigious great sailing ship where many sea songs were sung, was the setting in the summer of 1985 for the regular concerts of 'sea songs' amongst which not one single traditional song figured! In general the knowledge of the old sailors is never given the place it deserves at great nautical events. Whereas in Great Britain, the departure of a great transatlantic race is initiated by a singer of seasongs (Stan Hugill on this occasion) making thousands of spectators join in a hauling shanty. In remaking contact with this constant tradition, perhaps today's pleasure-boat enthusiasts will recover a little of the maritime personality which it is about to lose. Didn't the regatta-goers in Nantes at the end of the 19th century already have their own repertoire, always up to date? ...Avant qu'on appareille Vidons une bouteille Puis hisse la toile et foutons le camp Pour aller voir Gueule de Serpent! (Gueule de Serpent - lit. snake's maw - an almost legendary inn-keeper on the river Loire who always had eels and other delicacies even out of season). Besides the written works and records mentioned in this article, we should mention the collections of Fernand Gueriff, Chansons, romances et poemes des anciens de la voile (1972) and by Chasse-Maree, Cahier de chansons de marins (1983), as well as the five volumes of l'Anthologie des chants de mer by Chasse-Maree. 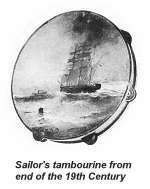 A list of various groups and singers of sailors' songs, French and foreign, is available: write to Chasse-Maree. This article first appeared in the French magazine 'Chasse Maree' and is reproduced with the author's permission. Translation by Janet Russell and Paul Wright to whom many thanks.